To develop and maintain superior value for our customers. We’re meticulous when it comes to our transportation management system because when you choose Full Tilt Logistics, you deserve care and detailed attention. Full Tilt is a different kind of freight logistics service provider. See what makes our logistics operations tick and why more shippers choose us over other freight logistics providers. Full Tilt focuses on matching our products and services to your freight logistics needs. Every time. Quoting shouldn’t just be about a price, it should also be about what it takes to get your shipment moved. At Full Tilt Logistics, we do our research on Route Surveys, Permits, Escorts, Market Rates, and anything else you might need, before ever sending you a quote. You’re getting a valid number with everything included, not just a price. Things happen. Problems occur. We don’t leave you with those problems, we fix them. If damage happens, we manage your claim and help expedite the process. If a truck breaks down, we find you a new one. We help customers understand shipment requirements and assist drivers in getting to a pickup location to meet an appointment time. We are the freight logistics company that alleviates your stress. Your success means our success. When you want something done right, who do you go to? You go to the more experienced freight forwarders. We pride ourselves on our experience. Since 2014, we’ve handled almost every type of shipment there is. We have the knowledge and experience to know exactly what it takes to get your project picked up and delivered on time and within budget. We work hard to make your job easier. That’s why we do more than just find you a truck. We set up your order. We deal with all parties involved, including the shipper and consignee. This means everything from inventory management and warehouse management to shipment management. We see it through until the end and make sure you’re satisfied. With Full Tilt as your Freight Logistics Company, it’s not just about finding someone to move your freight, it’s about seeing the whole shipment through from start to finish. Experience. Honesty. Common Sense. Focus on the Customer. Regular Communication. As a premiere Freight Logistics and Transportation Company, our services include supply chain management, supply chain design, transportation procurement and route management, and company-owned dedicated energy efficient power units. We expertly manage the increasingly complex demands of today’s logistics. We’re more than just logistics providers. We’re strategic problem solvers who take a holistic approach to getting the most out of your network. With tested processes, robust technology and talented professionals, we assess your infrastructure top-down — seizing opportunities that ultimately steer efficiency. Tiffany Novich is the co-founder and CEO of Full Tilt Logistics. She is a graduate of the University of Nevada, Reno where she was the Captain of the Women’s Rugby Team. She grew up in Southern Nevada competing in High School Rodeo throughout the state. After graduating from UNR, Tiffany spent time fighting wildland fires where she met her husband and Co-Founder of Full Tilt Logistics, Nic. Tiffany is very passionate about fitness, nutrition and being physically active. She cultivates a positive work environment and encourages her employees to be who they are and build upon their strengths to be successful. She loves traveling, hiking, and exploring the nature around us. Tiffany loves being a Mom and spending time with her children, Avrie and Luke. Tiffany has a strong drive for life and work and strives to achieve a happy balance between them. She loves being involved in the community and helping people. Her focus is on growing the company, giving back to the community, and raising two wonderful children. Nic is a third generation Nevada native with a strong work ethic, a personal drive for success, and a huge heart. He developed this mentality on a hotshot firefighting crew where he spent five years battling wildland fires protecting people and structures throughout the West. Nic was also heavily involved in assisting in the Hurricane Katrina rescue and clean-up efforts. Nic began his career in logistics in 2006 while living in San Diego -- it is there that he discovered his passion for the industry. Nic was a key contributor starting two brokerages for larger companies before starting Full Tilt Logistics with his wife and CEO, Tiffany. Nic is dedicated to growing his business and maintaining a strong team of passionate and devoted employees. He is committed to providing the best level of service available and ensuring that his customers are completely satisfied. Nic is an active outdoorsman and athlete, a strong community supporter, and along with his wife the proud parents of Avrie and Luke. Cindy Novich joined Full Tilt Logistics in the summer of 2015 as an owner and Chief Financial Officer. Cindy leads the Full Tilt accounting team as well as handling other finance functions. As part of the leadership team, she works with other leaders to grow Full Tilt operations while maintaining excellence for both customers and carriers. Cindy began her career in public accounting in 1984. She worked in the healthcare field for 26 years as a private medical practice executive for medical groups in Reno, Nevada. Upon her retirement she made a 180 turn to assist family in the Full Tilt Logistics business. Cindy graduated from the University of Nevada College of Business with her Bachelor of Science in Accounting. Cindy is married to Robert Novich and together they have two sons, Nicolas and Cristofer. Grandchildren Avrie, Porter, Luke and Paige keep them happily entertained. Travel, reading, music, Nevada Wolfpack athletics, and quilting fill the rest of her time. She also proudly supports Susan G. Komen and St. Jude’s Children’s Hospital. Jessica is a Nevada native who was born and raised in Reno. She attended local schools and was an elite athlete earning eight varsity sports letters and being elected into the McQueen High School Hall of Fame in 2015. She was also a key member of the University of Nevada women’s softball team that won the WAC Championship in 2009. Jessica is a competitive distance runner participating in several local events including the Reno Tahoe Odyssey and Tough Mudder competitions. She has run half marathons and is now training for a full marathon. Jessica is a 2010 graduate of the University of Nevada and has been with Full Tilt since the company’s inception in 2014. She started as a traffic coordinator and is currently Chief Accounting Officer. When the opportunity arose to become an owner of the new Reno trucking company, Full Tilt Transportation, Jessica was all in. She has the unique ability to balance her demanding professional life, with the highest responsibility of being a mother to Porter and Paige and wife of co-owner Cris. This tight-knit family is goal oriented and steady and manages to carve out quality family time while running a rapidly growing business. Full Tilt truly is the textbook definition of a small family-owned business with 100% owned by five Novich family members. In her spare time, Jessica and her family thoroughly enjoy the Reno – Tahoe area and all it has to offer. Whether hiking, golfing, supporting Wolf Pack athletics or planning large family gatherings, she has an energy level and drive to thrive in all aspects of her life. In her spare time, Jessica volunteers at the local Boys and Girls club serving as a mentor since 2014. Cris feels fortunate to have been born and raised in the Reno community surrounded by a supportive family and lifelong friends. He has deep Nevada roots as a third generation Nevada native with family origins in Ely and McGill, Nevada. Cris is blessed with a lovely wife and co-owner Jessica, their handsome son Porter John and beautiful daughter Paige Jean. Cris is a former PGA Class A golf professional and was an instructor at some of the best golf courses in the country. He loves to play golf, fly fish and travel as time allows. Before joining Full Tilt as Director of Sales, Cris built a very successful practice as a Financial Advisor where he received numerous awards for production and client satisfaction. Cris is passionate about volunteering with the Boys and Girls Club of Truckee Meadows as a member of the Junior Executive Board of Directors. Cris is also a founding board member at Mater Academy in Reno, a charter school that will be opening in the Reno area in 2017 to serve the less fortunate youth of the community. He also supports youth sports, Moms on the Run, Urban Roots, and the MS Society. Making the decision to become an owner of Full Tilt Transportation was difficult, however, Cris felt it was the best decision for him and his family. His track record as a financial advisor made it difficult to step away, however; he believes joining the family business and building a great company was an opportunity he could not pass up. 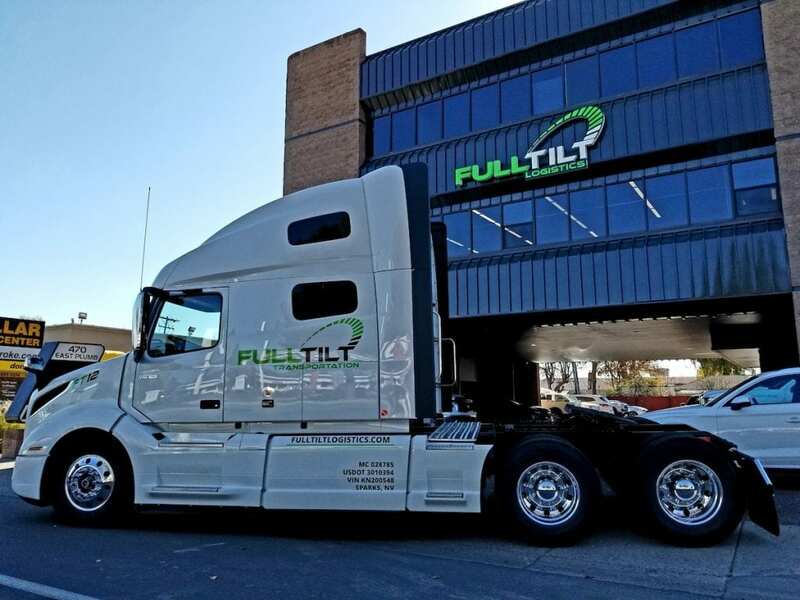 Cris is excited to bring his skills and focus to Full Tilt's new Reno trucking company and help create the best transportation company in the country. Full Tilt knows it is our team that makes the Full Tilt difference, that's why we take care of you. With a great company culture, great benefits and hardworking industry professionals, Full Tilt is proud to be one of the top rated places to work in the third party logistics industry. "When I decided to come on full time with Full Tilt Logistics, I made a huge shift from my previous experience and education but I do not regret it for one second. There is not a single day that I wake up and dread going to work. The environment here is unmatched by any other place I have ever worked and it feels great to be a part of such a successful creation. I am grateful for this opportunity and I look forward to being a part of this special team for years to come." "Being new to the company and the industry I can say it is an up lifting change from my previous line of work. There is a certain comradery between employees and management that cannot be matched. It is pleasure to work here and I look forward being a part of this growing company." "Full Tilt Logistics is a rare company where you can experience joy, happiness and excitement. The industry is fast paced and consistently booming. The group of people here at Full Tilt Logisticsalways gives me a gratifying experience each day. I am ecstatic to be a part of This Dream Team." "Walking through the doors of Full Tilt Logistics every morning puts an instant smile on my face! The synergy of everyone working and laughing together creates an atmosphere I have a hard time leaving. I am lucky to have found a company that fosters such respect and success! I look forward to all of the memories ahead with my teammates as we climb to the top!!"